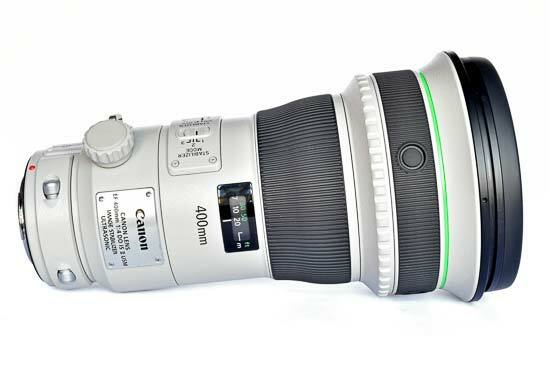 The Canon EF 400mm f/4 DO IS II USM is a fixed focal length super telephoto lens aimed at professional and enthusiast amateur photographers and is designed for shooting sports and wildlife. 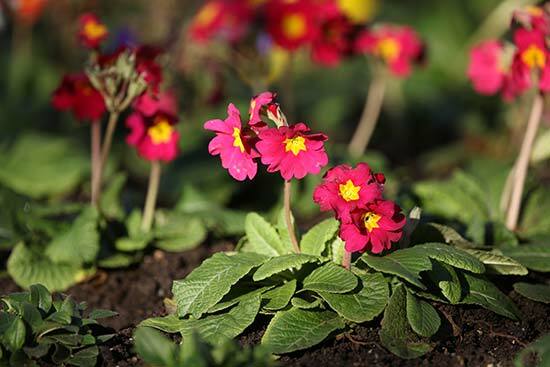 Its main selling points are unparalleled optical quality and its relative compactness. 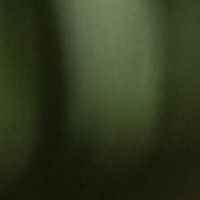 Both these features owe a lot to the DO designation in the lens' model name, which stands for Diffractive Optics, and is indicated by the green ring around the front of the lens barrel. These special glass elements feature a saw-tooth cross section and allow light to be focussed at tighter angles while maintaining a relatively flat lens profile, thereby enabling the overall length of the lens to be compressed. Other plus points of Diffractive Optics are minimised chromatic aberration and flare. The lens incorporates an advanced ring-type Ultrasonic Motor AF system that includes a Power Focus mode for smoother and quieter focussing transitions when recording video. 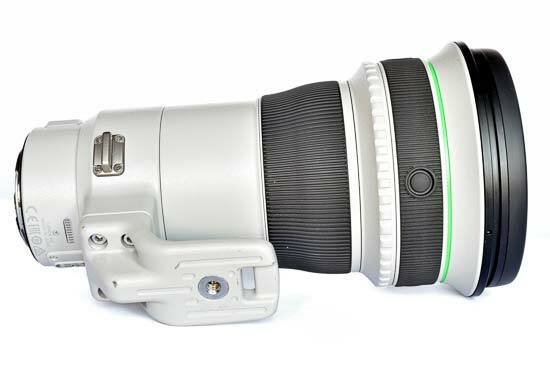 Naturally, the lens includes Canon's Image Stabilizer technology that provides a 4-stop advantage, which when combined with the lens' relatively light weight means it can be used hand held in good light. The stabilisation is also able to detect horizontal and vertical panning motion and only compensate for movement in the opposite direction. 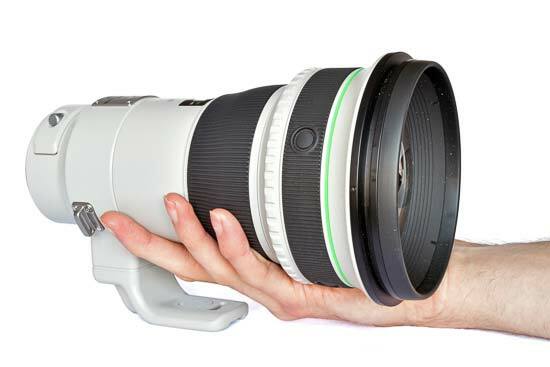 Despite the relatively low weight, the Canon EF 400mm f/4 DO IS II USM still utilises a rugged magnesium alloy construction and is fully weather sealed against dust and moisture. There's also a fluorine coating on the front lens element to ensure fast raindrop beading and smudge resistance. 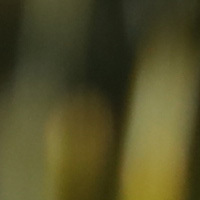 Other lens specifications include a rounded 9-blade diaphragm to help produce smooth bokeh blur, and a minimum focussing distance of 3.3 metres. 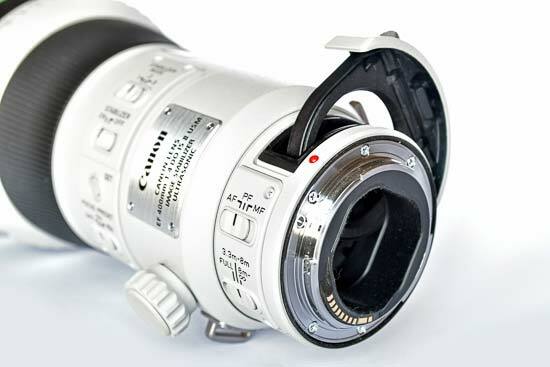 Canon bundles this lens with a high quality lockable hard case and lens hood, as well as front and rear caps. 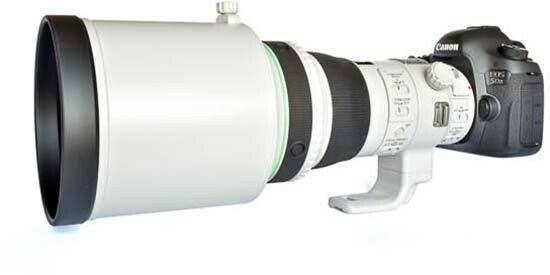 All this doesn't come cheap, however, as the EF 400mm f4 DO IS II USM will set you back around £6999/$6899. 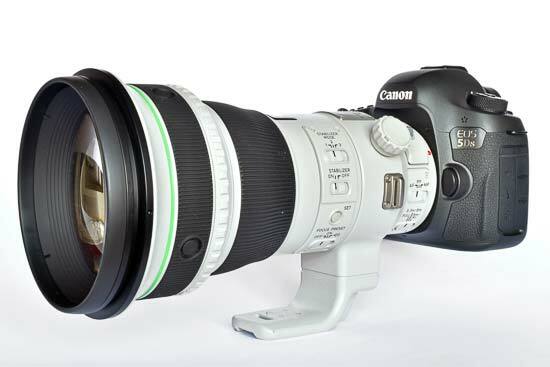 Canon markets the EF 400mm f4 DO IS II USM as compact and light weight, though you'd be forgiven for raising an eyebrow or two at this claim, given the lens is still 232.7mm long with a maximum diameter of 128mm and weighs in at a hefty 2.1kg. 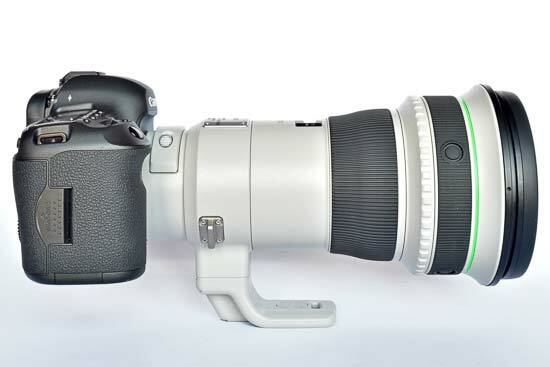 However, we need some perspective here, as Canon's EF 400mm f/2.8L IS II USM lens is almost 50% longer and 30% larger in diameter, resulting in a huge 3.85kg mass. 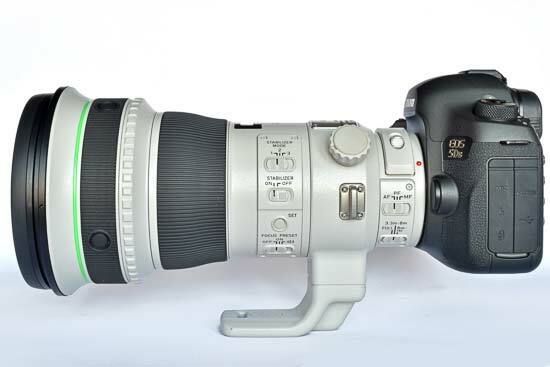 Despite the diet, the Canon EF 400mm f/4 DO IS II USM still has a full array of toys. Moving from the front of the lens, the first buttons you come to are positioned within what appears to be a focus ring, but is actually a just fixed grip. These four controls are AF Stop buttons and are spread equally around the lens barrel. 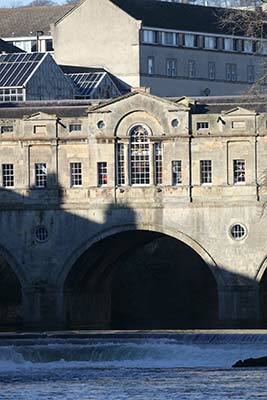 They all have the same function, which is to temporarily pause autofocussing when held down. If you're also holding the camera's shutter release at the same time, autofocussing will resume as soon as you release an AF Stop button. 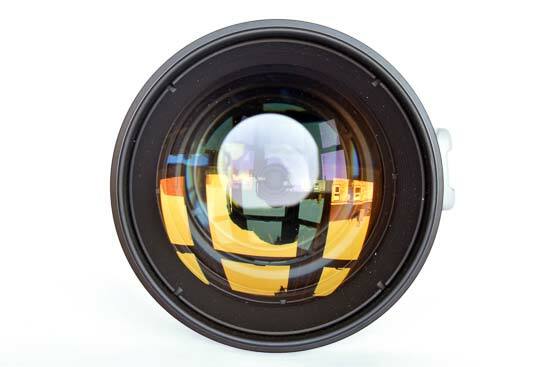 Directly behind the AF Stop buttons on the lens barrel is a narrow knurled ring called the Playback Ring. This has two functions. The first controls Focus Preset, whereby you can set a specific focussing distance (more on this later) and recall it by twisting the Playback Ring left or right. The second Playback Ring function involves the lens' Power Focus mode. When this focussing mode is activated, turning the Playback Ring focusses the lens electronically for smoother focussing transitions while shooting video. 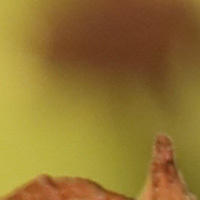 Turn the ring a little and the lens focusses slowly, or rotate it further for faster focus transitioning. Moving further back along the lens barrel and we find a wide, grippy manual focussing ring, and directly behind this and on the top of the barrel is a focus distance indicator window displaying distances in feet and metres. Then there's the usual row of function switches. Topmost is the Stabilizer Mode selector, which gives you three options. Mode 1 corrects vibrations that move the lens in any direction, whereas mode 2 only compensates for vertical camera shake while panning horizontally, or horizontal shake when moving vertically. Finally, mode 3 stabilisation operates in a similar way to mode 2, but only applies stabilisation at the point of exposure, so you're free to track a rapidly moving subject without encountering any visual ‘resistance' from the stabilisation system. Beneath the Stabilizer Mode control is a simple switch to simply turn stabilisation on or off. Two further controls are located beneath the Stabilizer switches, and these let you set the aforementioned Focus Preset function for later recall using Playback Ring at the front of the lens. This predefined focus position can be set by moving the Focus Preset switch to the ‘on' position or by selecting the speaker icon, before focussing with the camera or manually focussing the lens to a desired point. Pressing the ‘SET' button – located above the Focus Preset switch – then locks the focus distance for future recall. Next up along the lens barrel is the tripod mounting ring. This rotates very smoothly on ball bearings, with indentations placed at 90-degree points around the barrel for quick and precise movement between landscape and portrait orientation. A knurled knob locks the lens in place within the tripod ring, however the ring itself cannot be removed from the lens barrel, which isn't great if you fancy shedding some extra weight while handheld shooting. The tripod ring also incorporates mounting points for the included carry strap. 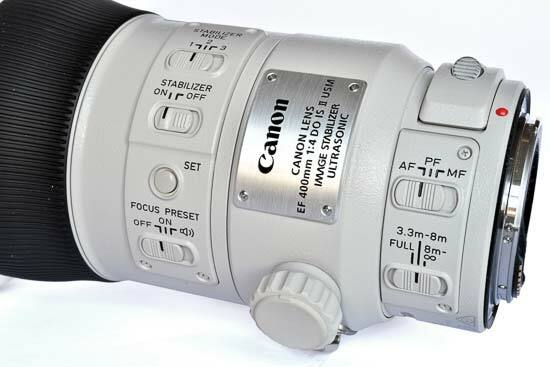 Right at the back of the Canon EF 400mm f/4 DO IS II USM lens, next to the mount, we find two switches related to focussing. The upper switch lets you choose between automatic and manual focussing, though there is a third ‘PF' option that selects the electronically-driven Power Focus mode for slower, smoother and quieter focus shifts during video filming. Beneath this switch is a focus distance selector, with options to restrict the focus range to between the minimum 3.3 metres and 8 metres, or from 8 metres to infinity. The last feature on the lens itself is a drop-in filter holder, accessed by squeezing the two release buttons and sliding the holder upward. The holder incorporates a clear glass filter and is also designed to accept gel filters, sandwiched in place with a retaining flap. An alternative 52mm polarising filter can be installed in place of this holder, however, it comes as a complete unit with the squeeze-release mechanism attached and is rather pricey. A cheaper and more versatile solution is to purchase an empty filter holder unit which allows you to mount regular 52mm screw-in filters. 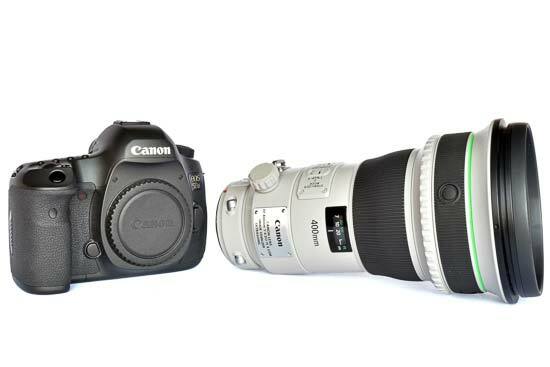 Finally, the Canon EF 400mm f/4 DO IS II USM lens includes several accessories. 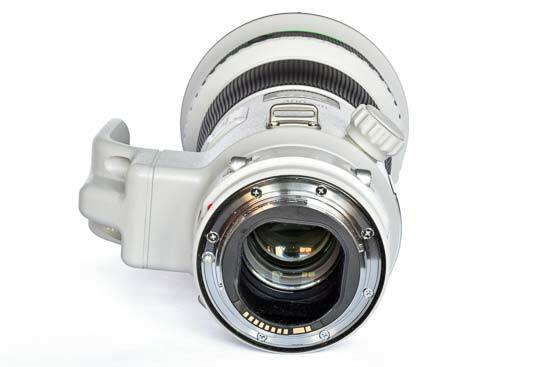 A large lens hood attaches in a typical fashion using a locking knob, and the hood can be reversed for more compact transportation. There's also a convenient soft front lens cap that fixes around the locking knob and secures with Velcro. 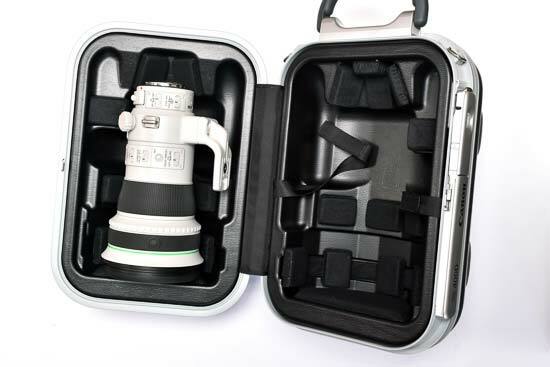 Canon also supplies a wide and relatively comfortable carry strap, but for safer transportation, the lens has its own high quality, lockable and form-fitting hard case. 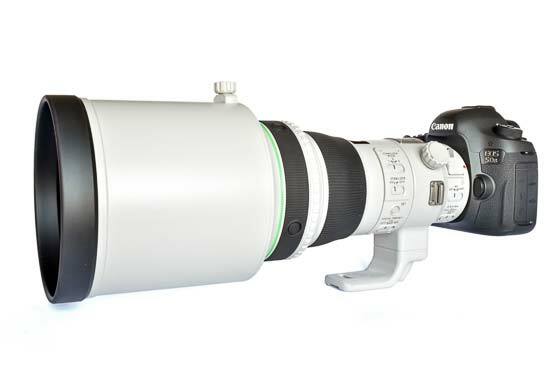 The Canon EF 400mm f/4 DO IS II USM's 400mm focal length gives an angle of view of 6 degrees on 35mm full-frame sensor and just 4 degrees on an APS-C camera. Canon's Ultrasonic autofocus motor focusses quickly and almost silently. Constant manual focus override is available, and there are no hard stops at each end of the focus ring's travel. 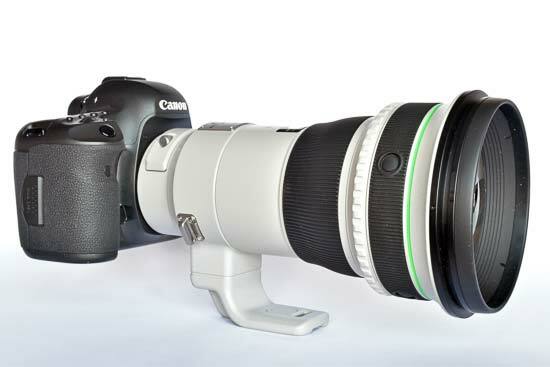 The use of diffractive optics doesn't just help reduce the Canon EF 400mm f/4 DO IS II USM's length, it also minimises chromatic aberration.  Where a traditional optical lens element will produce aberrations as a result of light being split into different wavelengths in a set order, a diffractive element will do the same, but separates the wavelengths in the reverse order. 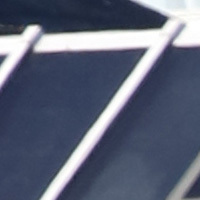 Combine both elements and the wavelength separation is effectively cancelled out, with chromatic aberration no longer visible in the final image. That's the theory at least, but it seems to hold true, as in our testing the Canon EF 400mm f4 DO IS II USM didn't generate any noticeable fringing. 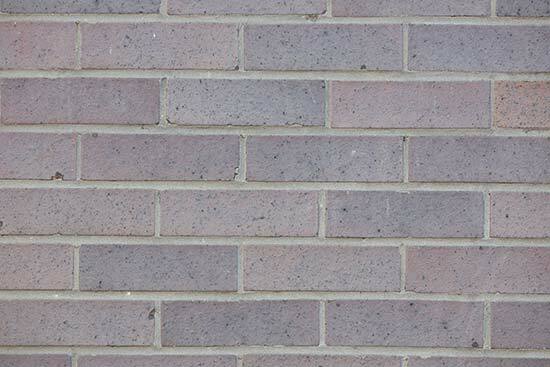 We've produced a couple of 100% crops of image areas that we'd have expected to show some aberrations, but not so with this lens. The Canon EF 400mm f/4 DO IS II USM has some minor fall-off at f/4, though the vignette is large and subtle, so isn't be noticeable in general shooting. At f/5.6 fall-off is very nearly eliminated, and it's gone completely at f/8. Being a no-compromise fixed focal length prime lens, it's little surprise to find the Canon EF 400mm f/4 DO IS II USM produces no noticeable distortion. A 3.3-metre minimum focussing distance means you won't be getting particularly close to a subject, but of course that's not what this lens is about. 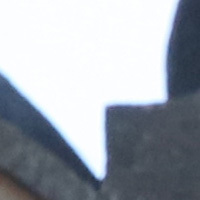 A maximum aperture of f/4 may not sound particularly impressive, but it's not difficult to throw backgrounds out of focus with the shallow depth of field that results from a 400mm focal length. 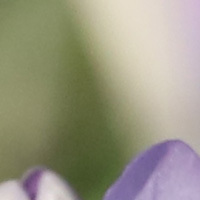 The lens uses a 9-blade diaphragm to help smooth out of focus areas, however bokeh is a fairly subjective part of a lens' image quality, so check out these 100% crops to see the Canon EF 400mm f/4 DO IS II USM's bokeh quality for yourself.